We all have our memories of The Moroccan Restaurant and its owner, chef, maitre-d, waiter and great Gibraltarian character that was Abdesalam. For those that knew where his establishment was hidden, it was a little jewel tucked away behind the hustle and bustle of Main Street, in humble Turnbull’s Lane. With only a few tables inside; 6 could sit comfortably, 8 would be a squeeze as no-one wanted to sit infront of the sliding door that unveiled the toilet! 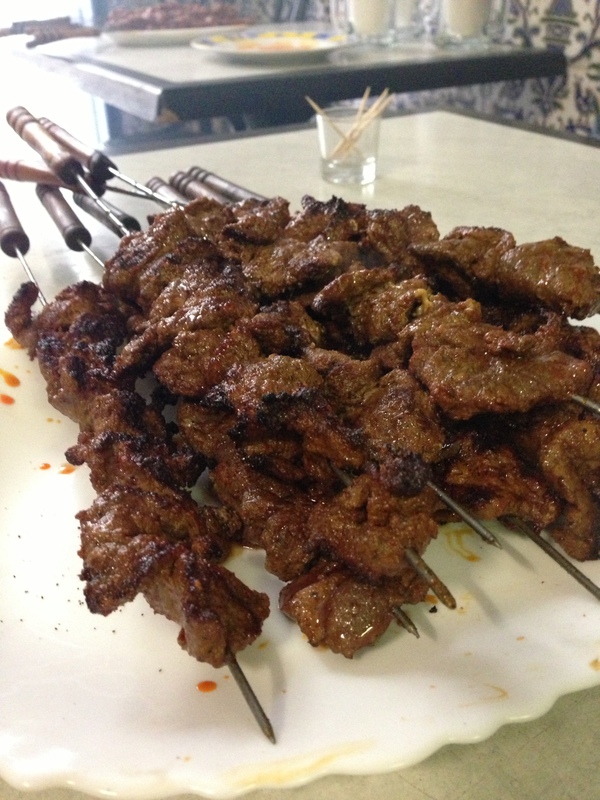 In summer, Abdesalam would set up a couple of tables outside and even though this extended his restaurant he wouldn’t necessarily want the demand. As Abdesalam’s approach was not that of a multi-tasking chef catering for several tables at a time. His was a methodical table-by-table approach. Pre-ordering was an advantage known only to some, otherwise, when you arrived he would take your order and start prepping and cooking especially for you; whoever arrived after you would have to wait until your table’s order was complete! Not the sort of place to go to in a rush. When at The Moroccan Restaurant it was like being stuck in a time machine where everything ran on Abdesalam-time – and everyone was the happier for it. ship and ordered chicken tagines and cous-cous. 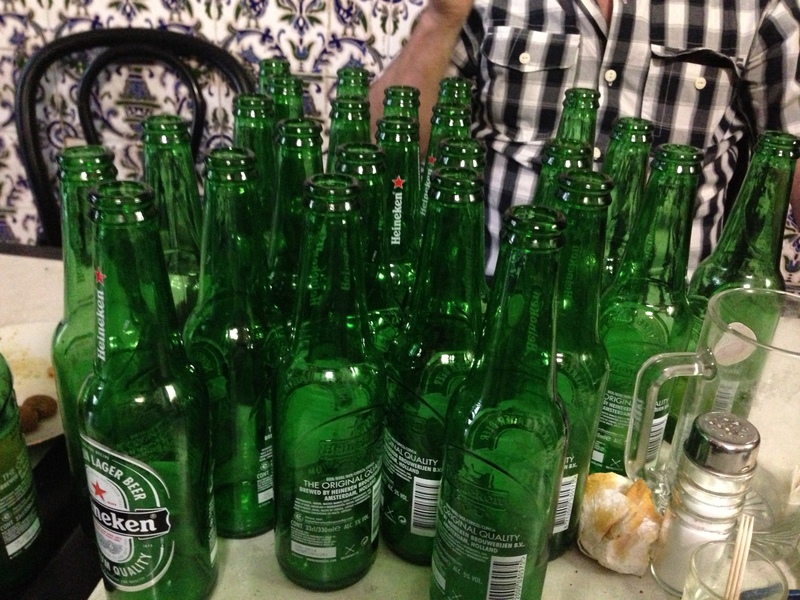 They were on a tight schedule; we were having a leisurely lunch with the endless supply of green Heineken bottles from the self-service fridge! The more anxious they became, the more thorough he seemed to stoke the BBQ to get the perfect white-hot charcoals to cook on. Thankfully they had been to Gibraltar before and had done all the tourist sites previously! Several people have recalled Abdesalam’s mantra, “Para gente de familia, no borrachos!” (A family restaurant not for drunkards) and, “Esto es un restaurante, no un bar.” (This is a restaurant not a bar.) As one of his pet peeves was people sitting at his tables drinking the cold drinks he was chilling for his clients. 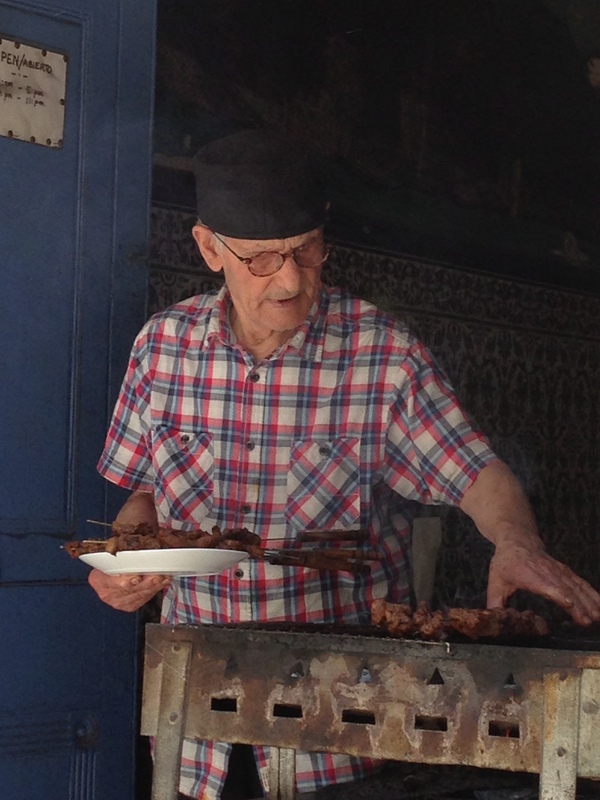 Abdesalam took great pride in providing you with his taste of Morocco whether it was a tagine (chicken or lamb), pinchitos (beef or chicken), cous-cous or even a simple tomato and onion salad. He would tell me that the reason why his beef pinchitos were the best was because he would buy good quality beef (carne de calidad amigo!) and then meticulously trim off the excess fat before marinating in his ‘secret’ spice rub. Not to everyone’s tastes; the decor with its chintzy relics of Morocco, dusty souvenirs of the red fez, babouche slippers and mint teapot variety adorning the cobwebbed shelves above the bar, the sliding door for the toilet that hung on a hinge and the service that ran on Abdeslam-time but I liked it, as did many. My article as it appeared in Calentita! press.